A pretty cool new entry into the saga, that very much feels like and it fits in with the original three films. This movie works on all kinds of levels. It’s got some very cool characters with new twists and angles to the Star Wars universe that we never expected to see in this world. From a Storm Trooper gone rogue to three strangers who are on all different sides of the conflict and still end up becoming friends, this one has a well-thought out and then well-executed plan. JJ Abrahms really delivers here, as director, showing us that his Star Trek films were just warm-up material to prepare him for something like this. He knocks it out of the park. The tributes to the original film, as well as the connections and continuations on already established characters, are all pretty fantastic. Take Han Solo and Princess Leia (now called General Leia,) for example. Their storyline, involving their son, is absolutely one of the highlights of the film. The action here is all fantastic, and with minor exception, the effects are all used really well to bring this world to life in ways that are absolutely stunning. Star Wars: The Force Awakens is a pretty great movie. That should come as no surprise, considering it is J.J. Abrhams directing. This guy is a smart and talented filmmaker, who really can do no wrong. His worst films were either Star Trek: Into Darkness or Super 8, and both of those were pretty fine pictures. They just weren’t fantastic like some of his other work. Abrhams is similar to the actor The Rock, in that he is like “franchise viagra,” only as a director. The Rock got nicknamed this, in the past year or so, for coming into franchises like G.I. Joe and The Fast and the Furious movies, and giving them an immediate lift. Abrahms does the same thing as a director with already established properties. From Mission Impossible to Star Trek to Star Wars, it’s pretty much his specialty at this point. And he does it by asking the question, what have we not seen before from this world, and maybe always been curious about, whether we knew it, or not? In Mission Impossible 3, it was seeing Ethan Hunt with a wife. Seeing him as a real person, with a life outside of the job. Similarly, In Star Wars: The Force Awakens, it is seeing a storm trooper without a mask, as a real person, with a conscience. A storm trooper actually ends up being one of the main characters in this film, as we learn what life has been like for this guy, and what’s going on emotionally for him, under the mask. This storm trooper character in question is Fin, (John Boyega, from Attack the Block.) In the opening scene of the movie we watch a pilot named Po (Oscar Isaac,) meeting with an older man to get a secret piece to a map. Then the stormtroopers and dark side forces show up. They capture Po, but only after he has hidden the map inside of a droid, named BB8. Now we meet the head of the dark side, Kylo Ren, (Adam Driver), wearing a really cool, Darth Vader-like mask. This guy has amazing powers that include catching a lazer bolt and freezing it in mid-air. We also watch that storm trooper, Fin, having doubts about what they are doing. He watches a friend of his die, and has the friend’s blood wiped across his white helmet. This, of course, is a strategy of the movies to help us keep track of this storm trooper, while he still wears the mask, and mixes in with all the others. It helps us to see him as an individual character. This is the same kind of technique that Dawn of the Planet of the Apes used by making Caesar’s son have a giant scar across his chest, so that we could easily tell him apart from Caesar. Just like in The Force Awakens, in that film, we saw the character get the scar at the beginning, so that it would stick in our heads for every time we saw it after that. Now this opening scene to The Force Awakens does a lot of things for the viewer. First, it introduces us to three out of the four new leads of the movie. There are four young actors, all being given major roles. There’s Boyega as Fin, Isaac as Po, Driver as Kylo Renn, and finally Daisy Ridley as Ray (She’s the one who we don’t meet just yet.) 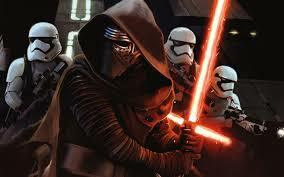 In that opening scene, we watch as Renn’s forces kidnap Po, and as Fin watches it from off in the distance. We also get some tributes to the storyline of the first film, which was all about the hiding and search for the death star plans. In that movie, Princess Leia hid the plans inside of a droid at the very beginning, then sent the droid (R2D2) off into space, and it was found by Luke Skywalker. He was a character, innocent to this world, who knew nothing about the jedi or dark side or the force. Here, it is Ray who finds the droid, and tries to get away from it, wanting nothing to do with this world of rebellion. She is the Luke Skywalker character, brought into the story simply because she finds the plans, hidden in the same place they were hidden in that first film. The visuals and use of effects and sounds, here, are all pretty spectacular. BB8 in particular is completely cute, lovable, and perfectly brought to life. He captures the feeling that audiences once had for R2D2. This guy rolls around on sand dunes, makes all of those adorable electronic noises, and tries to help our heroes out whenever he can. Abrahms nails BB8, the other droids, the light saber battles, and the spaceship chases, all fantastically. Just like in his Star Trek movies, effects feel like they are being used only to enhance the film, and not to do things that otherwise couldn’t be done. This is a director with self-control who doesn’t take advantage of the tools available to him. Minus one exception. At one point he does go a little too far, and it is felt pretty heavily. It’s with the character Supreme Leader Snoke, brought to life with motion capture, by Andy Serkis. This is a completely computer generated character, and boy does he look fake. Snoke looks like something out of the Harry Potter movies, meaning more like a drawing than like an actual person or creature. And unfortunately, Snoke is featured in multiple scenes of the movie. This is a real shame since the film went out of its way to get Serkis, the best in the motion capture business, for the part. Maybe it’s that every scene with this character takes place in the same location, with the same terrible lighting. Maybe it’s that we are looking at a giant projected hologram of character. Whatever the reason is, Snoke looks ridiculously fake, and it does take us out of the movie for a few moments each time he appears. The good news, this is one of the only things about the movie that doesn’t work. The story certainly delivers. Ray finds BB8 on a desert planet (just like Skywalker did,) and searches abandoned ships and wasteland areas each day, trading in her findings for money. Her introduction is really just about her finding BB8, and the two of them deciding to stay together. Meanwhile, we head back to the space ship of the dark side, where Kylo Ren tries to torture Po into telling him where the map plans are hidden. 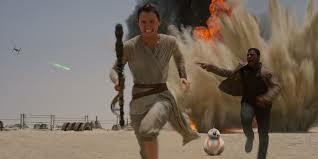 It is Fin, going rogue, and trying to get away from the storm troopers, who ends up freeing Po, and giving him a ride. Fin wants to get out of there just as much as Po does, only Fin needs a pilot. Po is his man. Before they escape, however, we get a brief scene with a very cool character, Captain Phasma (played by the actress who plays Brianne of Tarth on Game of Thrones.) This is a chrome-coated storm trooper (another one of those J.J. Abrahms touches of something we never thought we’d get to see.) The man has a knack for doing this and pushing the boundaries of the already-established worlds. If only we got to see a little more of this Captain Phasma character. Hopefully they are saving her for future films in the series. Po tries to take the ship with Fin on it, back to the planet he left, in search of BB8. He needs that map. We learn that the map is actually a set of directions for how to find Luke Skywalker, who is in hiding. The great Jedi warrior disappeared shortly after training the son of Han Solo and Princess Leia, and watching this man betray all of them and turn to the dark side. That Jedi Knight who turned against Luke and the others, now speaks to the decrepit helmet of Darth Vader, saying that he will finish what his grandfather started. The family connection, and way that it is emphasized, is pretty cool. So is the way that Renn has some force in him from Leia, who is, of course, Luke’s brother. Po and Finn go flying off in search of the map that will lead to Skywalker, and they get into a dogfight with ships behind them. Fin takes the shooting chair and controls the cannons on the ship. He doesn’t do a good enough job and the ship is shot down. Fin and Po are separated, and Fin comes across Ray and BB8. He stays with them, lying to Ray by telling her he is on the side of the Republic and one of their spies. At this point, Fin is really the connecting character. He is the one who went from the desert planet to the enemy ship, and then back. We now follow him and Ray as they search for a ship they can take off this planet and are given the Melenium Falcon. Not long after they board it, do the original owners of the ship, Han Solo (Harrison Ford,) and Chewbacca, arrive. Solo tells them all about the Force and the Jedi and the rumors they have always heard throughout their lives. Then he leads them into some more dog fights. At one point, a giant squid-like creature appears on the ship and attacks two different gangs that both show up, ready to collect from Han Solo at the same time. The squid scene is kind of dumb and pointless, but what’s nice about this section of the movie is that spending some time with Han Solo enables us to hear stories about his past. We are especially interested in learning about his son, and how Solo lost his son to the dark side. We start getting into that story a little bit more in the second half. At one point Leia arrives, (now named General Leia,) and she and Solo talk about their son. Solo says he will go see the boy and try to bring him home. That leads to another pretty cool, (although definitely telegraphed and predictable,) scene, with Han and his son on a bridge, much like what happened with Luke and Darth Vader in The Empire Strikes Back. While most of the ideas here are pretty cool, there are a couple of problems. First, the scene where Carrie Fischer (Leia,) and Han were talking about their son felt pretty flat and the acting really felt dry. The Leia character’s lines were all acted terribly. Luckily, this was only one scene. Another problem is how many times Renn takes off his mask. I would have been fine with him never taking it off at all, (like Darth Vader, up until the end of Jedi.) Keep the mystery angle going. Once would have been okay too. But this film goes the horror movie route, of saying that once he takes the mask off that first time, he continues to take it off again and again after that, making him less menacing every time we see the human face of actor Adam Driver. The movie does a really nice job of paying tribute to the original film and following a similar story structure. I love the use of a map to locate Skywalker being used as a McGuffin. I love the way we get a pilot and a worker, as new representatives of the older character archetypes from the original film, (Han Solo and Luke Skywalker,) and then this new twist of having a runaway stormtrooper. The action works. The dogfights are all terrific. I also love the new angle of having the villain be Han and Leia’s son. There’s a scene in the Cantina bar that the original film also featured, in the scene where Solo famously shot Greido. But all of the tributes aside, this movie also firmly establishes itself as something new and as its own thing. The way it does that is by really bringing in new, young actors as the leads. This is their story, and the story of their growing friendship with each other. Star Wars: The Force Awakens succeeds because of a whole slew of reasons. It features lots of creative ideas that only expand on what we know about this world. It has great action, visuals, and sound effects. It has plenty of cool tributes to the original films. And then, most important of all, there’s the intriguing story. I really like how the story seems prepared to bring in all of it’s new leads as characters early on, and connect them to each other, to help combine the different narratives into one single story. Fin really is the bridge that brings it all together. There are some things that could have been a little better, but ultimately, between the action, story, and cool ideas, this is a pretty great film.